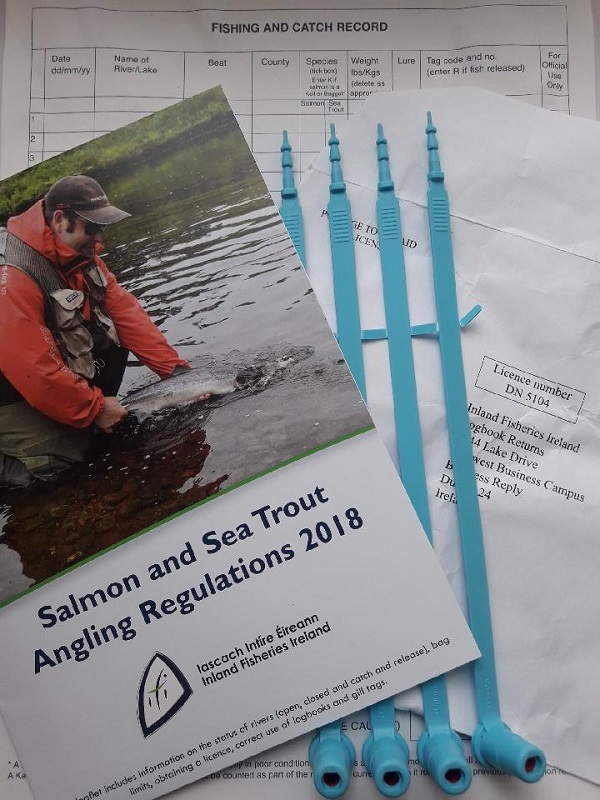 Inland Fisheries Ireland is reminding all salmon and sea trout anglers of the importance of returning their 2018 angling logbook and unused gill tags. These returns provide vital information and facilitate informed decision making on Ireland’s wild Atlantic Salmon and Sea Trout stocks. Anglers are asked to return their logbook as part of the Wild Salmon and Sea Trout Tagging Scheme which regulates salmon and sea trout fishing in Ireland and is administered by Inland Fisheries Ireland. In accordance with the Wild Salmon and Sea Trout Tagging Scheme, anglers are required by law to return their completed logbook and all unused tags to the issuing office of Inland Fisheries Ireland once they have finished fishing for the season or as soon as the season is over at the end of September and no later than the 19th of October annually. Anglers are reminded that they can only retain a maximum of one salmon per day in a fishery with a surplus provided they still have remaining tags in the month of September. The return of logbooks and tags can be done via the business return envelope which was supplied at the time of license purchase. In the absence of the prepaid logbook return envelope, anglers can return their completed logbook and unused tags to the Inland Fisheries Ireland office addressed on their licence/logbook. The records from this year’s angler returns will support management decisions in 2019. As part of the Scheme, an angler must attach a valid gill tag to a salmon (any size) or sea trout (over 40cm) immediately on landing. They then must enter the details of the catch and gill-tag used into their logbook. If the fish is to be released, anglers must also make a catch record in their logbook. For more information on the Wild Salmon and Sea Trout Tagging Scheme and Inland Fisheries Ireland, visit www.fisheriesireland.ie. Any queries in relation to the scheme can be sent to salmonlogbookreturn@fisheriesireland.ie .